The music starts. "I hear, that jingle-jangle-jingle..." It clatters in time with your walk. You wince every time you hear that dull clack and clank. Your driver (yes, the one you spent good money on) is rattling against your other clubs. You could use this as an excuse the next time you duff a drive: "Sorry about that guys, my driver has a nick in it -- right where the sweet spot usually is." You could also be just like the other wanna-bes who bought stuffed orange animals with black stripes to try and be like their hero. Or you could just break down and buy a new head cover for your driver. The TaylorMade Magnetic Driver Headcover takes the cake as being one of the slickest and easiest driver covers that even fits the larger 460 drivers. 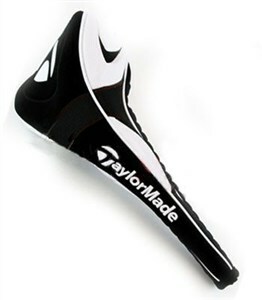 Its carbon fiber construction and durable materials make this head cover go the distance. Its magnetic opening makes it quick and easy to place and remove, and its embroidered logo declares that you care about the very best brands... um, even if your driver is generic. Some have complained that it was tough to remove the driver from the cover -- my opinion is that they are only nervous that this next swing could cost them a skin!